TURIN, Italy (AP) The Netherlands scored late to hold 10-man Italy to 1-1 in a friendly in Turin on Monday. Nathan Ake headed in two minutes from time to cancel out Simone Zaza’s opener. Italy played the final 21 minutes a man down after defender Domenico Criscito was harshly sent off for a poor last-man tackle. Both teams, which used to be powerhouses of football, failed to qualify for the World Cup and it was not hard to see why. Although Italy created the better of the chances it floundered in front of goal, while the Netherlands struggled to muster a shot on target until late in the match. It was Roberto Mancini’s third match in charge of Italy after a victory against Saudi Arabia last week and a defeat to France. ”It’s too early at the moment to see something,” Mancini said. ”We have to begin playing the youngsters, the ones who have less experience. Mancini changed 10 of the 11 players who started Friday’s friendly in Nice, keeping only Jorginho. Lorenzo Insigne became the first Napoli player to captain Italy. The Azzurri thought they scored within three minutes but Andrea Belotti’s strike was ruled out for offside. Italy had the better of the chances in a bright first half for the home side but wasted opportunities, notably when Belotti fired straight at Netherlands goalkeeper Jasper Cillessen from point-blank range. Criscito’s header was also cleared off the line by Ruud Vormer with Cillessen beaten. 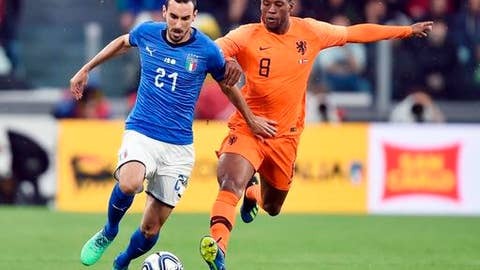 The Netherlands upped the pressure in the second half but Italy took the lead in the 67th after Federico Chiesa crossed in from the right for fellow substitute Zaza to slide in and fire into the bottom left corner. It was Zaza’s third appearance for Italy since missing his spot kick in a penalty shootout loss to Germany in the 2016 European Championship quarterfinals. ”I’m happy with the goal, because I had a bit of a sad memory of the national team,” Zaza said. ”I had a bit of luck but it’s only normal to be emotional. Two minutes later, Criscito was issued a red card for a desperate tackle on Ryan Babel. The Netherlands poured forward and got the equalizer thanks to two substitutes, as Ake headed in Steven Berghuis’ cross.